Will False Hope lead you astray... or to Dage? Descend into Dage’s Underworld! 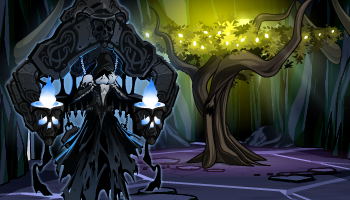 Dage the Evil, ruler of the Undead Legion, waits for you far below in the Underrealm. If you've found your way through the volcano on the Isle of Fotia, now is the time to begin your battles against the monstrous personifications of Guilty Joys: Anxiety, Old Age, Fear, Hunger, Death, Disease, Sleep, Agony, and Grief! With the guidance of Aeneas the Warrior and Sibyl the Prophetess, find the Golden Boughs, defeat each Guilty Joy, and make your way past the Elm of False Hopes to the river Acheron! Undead Legion members, assemble! To prepare for the coming Legion Champion Class, we released the Legion Champion armor. If you're a full member of the Undead Legion, speak to Dage the Evil in Battleon, Shadowfall, or the Soulforge to get this wicked-awesome armor and the Legion Token farming class that comes with it! Both versions of the armor unlock a legion token farming quest located at Dage the Evil in Shadowfall! The quest has a random chance to drop between 5-50 Legion Tokens! Note: the SoulKeeper pet's quest will be buffed later on tonight. 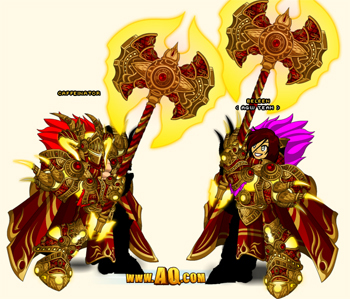 Unlock the Shadowfire Emperor set starting at 6PM server time when you buy any AdventureCoin package of 4.95 or more! Enemies of the Shadowfire Empire were known to turn and run at the mere sight of the Emperor's screaming skull symbol! New Gear in Beleen's Featured Artist Shop! And SO MUCH New Gear! Once you're done battling through the Underworld and slaying undead to join the Legion, check out this insane amount of items we've added to keep you looking as heroic as WE know you are! New armor set in the Treasure Chest: Nightwyvern set! The Summer Seasonal Token shop is live with the Lightbringer set! World War AQZ is just about to begin! Find the ZombieSlayer set in Doomwar! Illness: Boo! Contest and Class News: Yay! The Design Notes about the Lorepedia Bestiary art/writing contest AND news about the Legion Champion Class were supposed to go live last night, but I was battling a real life bug (and a low-grade fever). All that info will come early next week! Releasing later today when you buy 900 or more ACs! More news coming today on the Legion Champion armor and the Lorepedia Bestiary Contest! Dage the Evil wants YOU. Enlist Today! Dage is one Evil dude, that’s for sure. 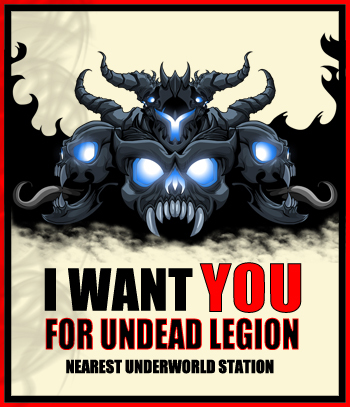 Do you have what it takes to become part of his growing Undead Legion army? If you meet the above requirements, then you are the perfect candidate for Dage the Evil’s Undead Legion! 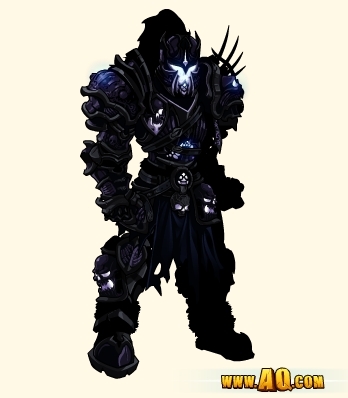 On Friday evening, Dage the Evil will unleash the Legion Champion Armor upon the world! If you have completed the above steps, then you are one step closer to becoming a Legion Champion. Wicked! Now that I have shared everything with you… you can begin (or continue!) your journey into Dage’s Undead Legion! Pink + Derp = Meeeeee! See what happens when Artix, Cysero, and Alina give me dibs on the Featured Artist Showcase Shop…! Happy Tuesday! 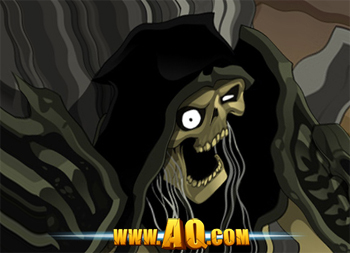 Today is an extra special day—with a major emphasis on “special.” As many of you know, every Tuesday your favorite online fantasy game features an AQW Artist with a special shop full of special items. 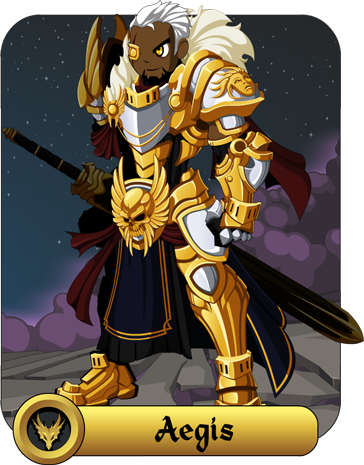 We have seen AMAZING armors, weapons, helms, and more from Tyronius, Jemini, Dage, Memet, Vokun, and others. When Tyronius’ shop leaves later tonight, I will take the stage with my collection of Derp-a-licious and Pink-a-licious items! YIPPEE! Ohhhh my goodness! There’s just soooo much PINK and soooo much DERP to make you /laugh, /cry, and /facepalm at the same time! 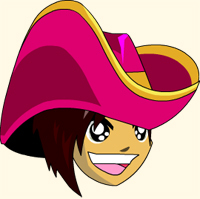 Captain's Bubblegum Hat - Rare! Lassie's Bubblegum Hat - Rare! Blinding Pink of Destiny! - Rare! Blade of Aww - Rare! 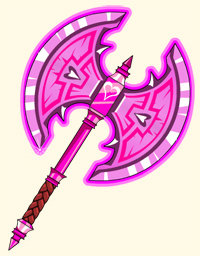 Before Artix sees what I have done (especially to his prized battleaxe), you should stock up on AdventureCoins now and get all those RARE pink items! Hiya! I’m Beleen! I go by many titles, like Pinkomancer, Giggle Guru, and the Scribble Scribe (all of which are true). 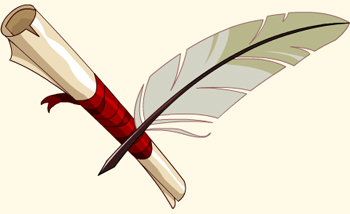 I joined Artix Entertainment back in May 2009 as the “AQWorlds Content Writer.” I wrote everything from item descriptions, quest text, character dialogue, cutscene scripts, Design Notes, newsletters, press releases, and zomg so much more. I also kinda became the “female voice” of AQW back when Artix and Cysero ran the show. HEY! Girls play video games too, yanno! 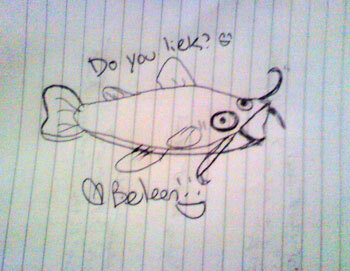 And thus, the bright pink bubbly Beleen that we all know and love was born! Speaking of being born… I was born in Los Angeles, California, a long long time ago. I lived in Cali for a few years before moving to Tampa, Florida, where I currently reside with my Mommy and sisters. I attended University of South Florida and got my major in Creative Writing with an emphasis on Marketing. My first job ever: Balloon Animal Artist. My second job ever: Artix Entertainment Writer. My third job ever: Derp Artist! 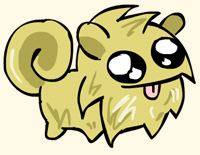 Back in August 2010, I tried my luck at creating a Pet O’ the Month. Since August is National Catfish Month (lol seriously! 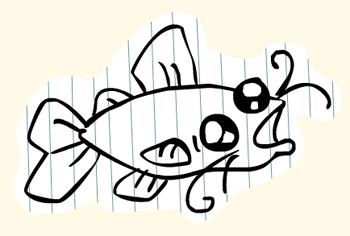 ), I attempted to draw a catfish. I begged Cysero to put it in game. Which he immediately shot down. “I mean, look at it. 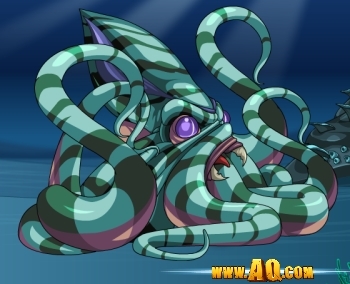 It's got a eye on its forehead.” However, as the requests piled up, and the more Cysero looked at that stupid thing, the more he loved the idea of getting it into game. And thus, the Derp Fish was born, which opened the doors to a whole WORLD of DERP and HURP and DERPITYDEEERRPS! Get your Free Download of the Derp Song on HeroMart.com! DerpQuest Worldz may be my lifelong dream… but in the meantime, you can get your DERP ON with my silly DERPY HURPY items in my Featured Artist Shop! 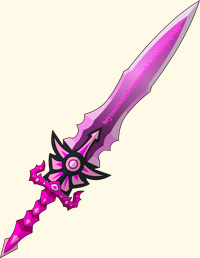 All the Pink and all the Derp you can handle arrives tonight in Battleon! What is happening to Lore's monsters?! Monsters: good for battling, BAD for losing to in battles. They can kill you, claw at you, and drop fantastic loot! But some of our monsters are much weaker than others... and some are way stronger than they should be. So what do we do? We send in the Monster Wranglers and Loremasters to track them, record their data, and help us keep order in Lore (as much as we can with Chaos on the loose)! Warning: Monster Health and Power Fluctuations! We are working to keep Lore's monsters as stable as we can. 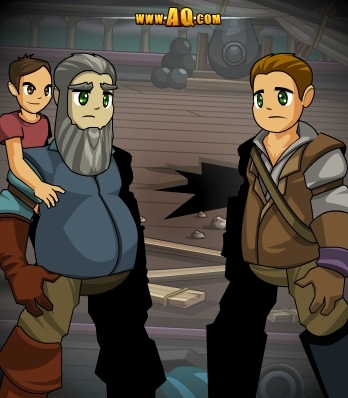 To that end, we'll be sending out Monster Wranglers to make sure their strength (HP) is in line with their age (level). Where monster HP and levels do not match up, we'll have our Monster Wranglers work arcane spells to correct them! Note: In plain English, we're re-balancing monster HP/levels so that we don't have level 45 monsters with 3,000 HP. The current HP values/levels the monsters have WILL CHANGE. This will take some time as we work out the best ratio, but it will help us make a better, fairer game for all players! Older Heroes Need Experience, Too! We're not just looking at re-working monster HP... we are ALSO going to re-do how you get experience from ALL monsters. Wouldn't it be great to get experience from ANY monster you fight, no matter what level it is? Getting the math in place to code that change is on our current project to do list. Cross your fingers and count your coders, because this is a change MANY of you have been asking for! Loremasters Needed for the Bestiary! This week, we are going to begin a NEW contest to chronicle the creatures of Lore! Help Loremaster Maya record ALL of the monsters we've got in-game so she can write the Bestiary (Battle)Field guide! 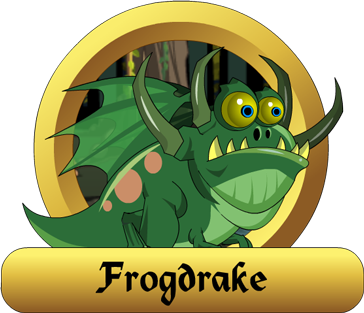 You can see an example of what we need your help creating here: Frogdrake Bestiary entry. Rewards: AdventureCoins PLUS getting your monster entry in the Lorepedia in-game (and possibly on aq.com) AND a Loremaster Art or Loremaster Writer character page badge! More details to come on this contest soon! …is the beginning of many adventures! We’ve got a whole action-packed week ahead of us in our favorite fantasy MMO. 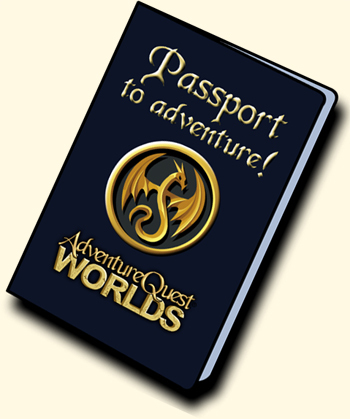 Check out everything in store—and everything that’s leaving the stores, too—in this week’s AdventureQuest Worlds release write-up! The countdown timer is ticking! Adorned with Blood Lord loot, Tyronius’ Featured Artist Showcase Shop in the Battleon Game Manu leaves Tuesday afternoon. 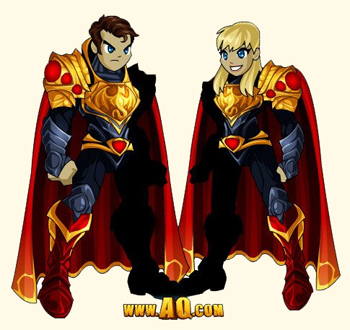 Now is your last chance to get the Blood Lord Plate Set before it goes rare! 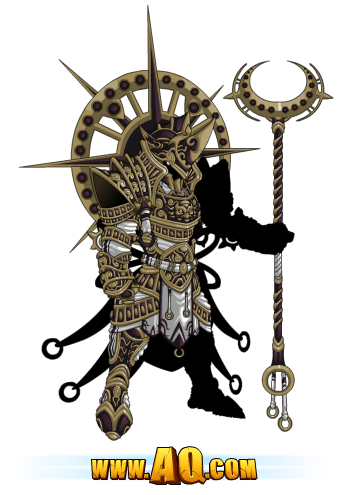 Blood Majesty Set, and the color-custom Abyssal Darkness Set will return the next time Tyronius has a featured artist shop (but we don't know when that will be)! There’s something for everyone in Tyronius’ shop! Alright folks. Let’s get something straight: I am, by no means, what you would consider an “artist.” As a writer, my artist expression flourishes with an ink-dipped quill on lined canvas. My first attempt at a "catfish." Props for making it uglier than the real thing. However! For whatever reason, I have been granted with the power of DERP. I make ridiculous monstrosities DERP and HURP all over the place, and tomorrow you too will be blessed (or cursed?!) 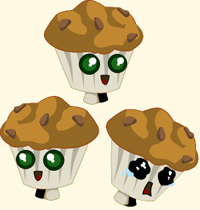 with my derpy creations. Oh and don’t worry, it wouldn’t be Beleen’s Shop if there wasn’t any PINK! After hearing your suggestions on my Twitter, I have buffed a bunch of your favorite items with Adorableness (aka lots and lots of pink)! I’ll post some previews on my Twitter first…and then flood the Design Notes tomorrow morning with ZOMG SO MUCH NONESENSE!!11!1one!! Each Tuesday, AQWorlds releases a special “Limited Time Featured Artist Showcase Shop” loaded with items that an Artix Entertainment artist creates using their own style and flair. At least one RARE item will be included in each artist’s showcased shop. All other items in the shop may or may not return at a later date—that’s all up to the artist! TheRare Item will always sell for AdventureCoins (free storage woohoo!) and will ONLY be available during that week. All good things must come to an end. 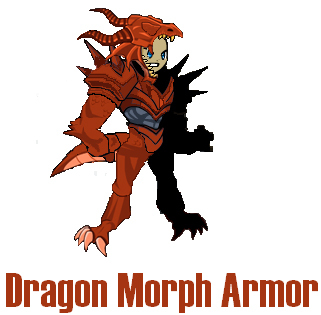 Including the special offer DragonClaw Armor Set when you purchase any AdventureCoins package worth $4.95 USD or more! DragonClaw set bids its farewell on Thursday, June 27, at 6pm EST. If you wanna taste the power of the Dragon, get your DragonClaw Set now AND get more AdventureCoins that you crave! Do we have a deal for you! 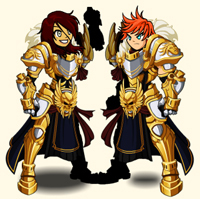 The Color-Custom Shadowfire Armor Set will become available after 6pm EST on Thursday, June 27, when you purchase 900 AdventureCoins or more! Descend into Dage’s Underworld this Friday night! Now that the Volcano on the Isle of Fotia has frozen over, a path leading deep into the Underworld has opened. The entrance to the Underworld harbors Underworld Souls and the monstrous personifications of Guilty Joys: Anxiety, Old Age, Fear, Hunger, Death, Disease, Sleep, Agony, and Grief. With the guidance of Aeneas the Warrior and Sibyl the Prophetess, you must find the Golden Boughs, defeat each Guilty Joy, and make your way past the Elm of False Hopes to reach the river Acheron! 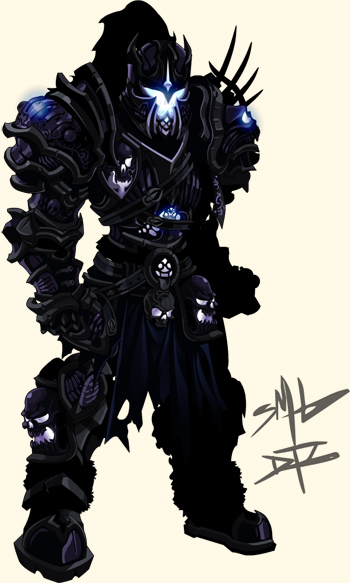 Dage's Legion Champion Armor and Class! To prepare for the coming Legion Champion Class, we are releasing the Legion Champion armor this week! It is only available to Legion Members, but as long as you ARE in the Legion, you can purchase the armor for AdventureCoins OR farm Legion Tokens to create it! Even MORE for you this week! Happy Saturday everybody! Yesterday we saw the darkest, deadliest dungeon EVER release in your favorite online adventure game. Once you're done dying through Grimskull's Endless Vault of Doom, check out all this OTHER great gear! 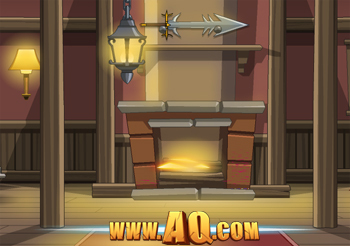 As soon as you log into AQWorlds, the Dragon Menu pops up, loaded with all sorts of awesome destinations and shops. When you click on “Shops,” you will be taken to another menu with TONS of shops, including the Treasure Map Shop. And this is where you can buy your Treasure Map for only 2,000 AdventureCoins! When you decipher the clue on the map, and then find the shop hidden somewhere in-game, you’ll gain access to EVERYTHING we have ever added to it! Last Friday, we sneakily added the elusive Blood Terror Set to this shop. Will you be the next Blood Terror to wreak terror across the world of Lore? There is only 1 way to find out—if you CAN find it, that is! 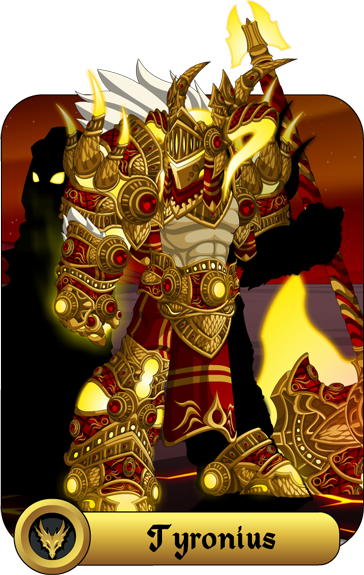 As if the BloodTerror isn’t awesome enough, feast your eyes on the Solar Protector Set! WOAAAAH! The Solar Protector is absolutely wicked! And it’s even Color Custom, too! Starting this Friday at sundown, you can harbor the impressive Solar Protector armor set using your Treasure Map. It’s because of players like YOU who continuously make AQWorlds the best online fantasy game ever. =D You guys and gals always come up with great suggestions and item ideas, and on Friday, we will update the Suggestion Shop with even more of your great ideas. 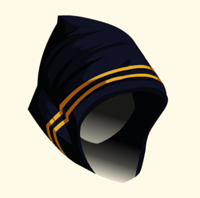 Over 200 player suggested items are available in Yulgar’s Inn! And we’re adding even more on Friday! 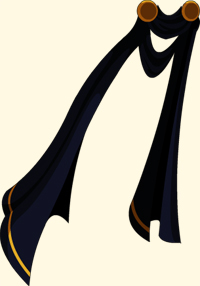 So /join yulgar , talk to Yulgar, click on “Shops,” and check out the “Legendary Suggestion Shop” and “Suggestion Shop” to get your fill of items inspired by your fellow heroes! To celebrate the newest movie on the big screen (…without getting sued for copyright infringement), we are releasing the Hero of Steel Shop on Friday! 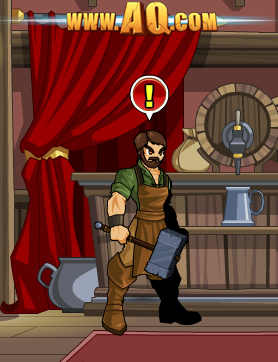 This shop will contain the Good Hero of Steel, the Evil Hero of Steel, AND the Hero of Steal Armor Sets. The Hero of Steel is our take on Super Man's outfit, while the Hero of Steal is a thief-themed armor that is our take on wordplay. 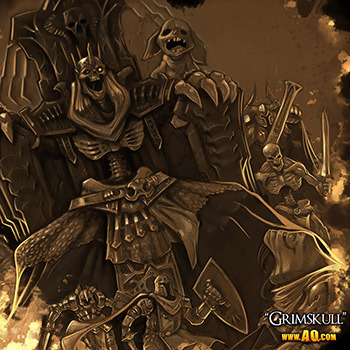 We thought the stories and legends about him were just campfire tales, made up to scare young Knights in training... how could GRIMSKULL be real!? 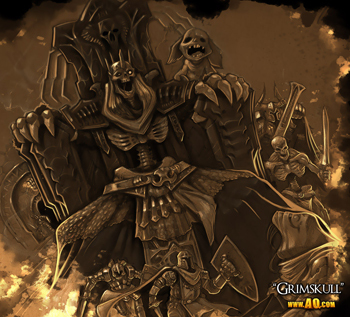 Grimskull is the master of the worlds most evil, death trap filled dungeons. If the stories are true... then anyone who enters his dungeon in ssearch of "HEROBLADE - The Worlds Most Powerful Weapon" will end up facing a horrifying and highly comical demise. This Friday you will venture into Grimskull's first dungeon, "THE ENDLESS PIT OF DOOM!" 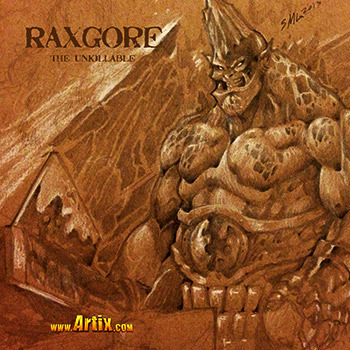 If you survive the traps (insert the sound of Grimskull cackling here) and reach the end... you will have to face Raxgore the Unkillable. Much as his name would suggest, Raxgore is immune to weapons, spells, elemental damage, posion and... well, he cannot be killed by any foe. He was a cruel and merciless champion of the arena before he went missing some 10 years ago. Songs of his bloodthirtsty hunger for combat are still sung by bards. Note: Raxgore was well known for slaying bards who sung about him... and all the people listening to the song... and all the people who knew the people who had heard the song. Raxgore was pretty unreasonable. Each room of this new dungeon requires a large amount of custom code on every frame. The first part of the dungeon is 42 rooms long. As you read this out programmers have started on room #11. We will be working through the weekend and next week to have a smooth, polished release ready for you. With enough testing, the only frustrating part of next weeks release... will be Grimskull's evil, evil, evil, evil traps! AND SO MANY DEATH TRAPS!!!!! Ghost's cutscenes are absolutely hallarious. That is, if you enjoy watching yourself meet a horrible and grizzly demise.... and then being laughed at. *dramatic pause* We feel that people are really going to love hating Grimskull. J6 created the backgrounds and art for the traps. The dungeon reminds me of the things I loved about DoomWood. It is always exciting to see what is going to be in the next room. A lot of work went into this release from all of the AQWorlds team. In Grimskull's dungeons, cutscenes are all about you going *SPLAT*. The second, hidden, part of the dungeon may never even be found by casual players (You would actually have to read to figure out how to access it... "OMG!") and contains high level monsters and excrutiatingly painful versions of the traps. The reward, will be well worth it. However, be warned-- part 2 will probably not be available this week... because the first half of the dungeon is 42 rooms long, each one requiring custom code by the programmers. The most complicated dungeon ever programmed in the history of the game. This is... a new "1st!" Those of you who have been following the news on this release already know that it was a lot more work than our small team expected. From the traps to the SCORRORBOARD (Grimskull's highscore board which counts the deaths of EVERYONE who goes splat in the dungeon), Dumoose and Yorumi deserve massive kudos and applause for their sleepless nights of coding. Even though we pushed the release back a week, it was still barely enough time. Actually, as I am writing this, Dumoose is still coding the final rooms. The puzzle rooms are built around the same concept as AdventureQuest3D's interactive objects. 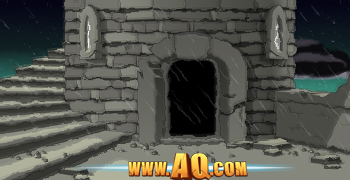 Except, the infrastructure does not exist in AQWorlds... so the only way to do this was to build each lever, button, door, secret door, trap and program it individually. One of my favorite parts of the dungeon are the monsters that change your character's size when you slay them. Get back in there and try again! Tweet how many times you died to Artix, Alina, and Dumoose! Check out the updates to the Featured Artist, Suggestion, Treasure Map, and Hero of Steel shops! (Coming later tonight! “Wet” did not do justice to the state we were in. Soaked, maybe. Drenched. I could’ve drowned a moglin in my boots. Not that I would, that’s sick. It was miserable. The only thing that gave me the slightest comfort was knowing that the other members of my party were suffering just as much as me. When the orange firelight of the inn came into view through the rain and the fog, I felt like cheering. All four of us trudged into the stables to change, because no self-respecting innkeeper would let us within spitting distance of the hearth, sodden and filthy as we were. We took off our armor, donned our plainclothes, and sprinted through the doors to avoid the rain as much as possible. Deidrick paid for our stay and the rest of us ordered food. We sat down gratefully in front of the hearth. I looked around. The place was pretty much empty, except for us and a hooded man, face barely visible, dressed almost exclusively in rags sitting in the corner, far away from the fire. As we acclimated to our surroundings, the rest of the party took notice of him. I turned to Hawthorne. We whispered amongst ourselves. Trist was worried about him. She wanted to ask if he was okay, we could tell. But before she could say anything, Deidrick spoke up, with his loud, booming voice. He looked us over. We didn’t say anything. It can be dangerous to upset Deidrick. He turned his gaze on the man in the corner. Trist looked angry, but Hawthorne put a hand on her shoulder, and shook his head. Just because we’re mercenaries doesn’t mean we don’t have common courtesy. But Deidrick gets us the jobs, and Deidrick pays for our meals, so Deidrick gets what he wants. The man in the corner got up unsteadily and shambled his way towards us. When he spoke, his words came out in a choking rasp. I barely managed to stifle a cough as he came closer. Hawthorne was right. The man smelled truly putrid. He leaned in close to me, and it was all I could do to stop myself from gagging. We never had much, see? Barely had enough for the farm and the clothes on our backs. There ain’t much for a poor farmer’s boy out there in the world. Surely you know that. That’s why ya became mercenaries, I’m bettin’. That’s what my son tried to do, anyhow. Any company he tried to join rejected him, of course. What sorta mercenary company would take a boy who can’t even afford a proper sword? So he came back. Had a fire in his belly, he did. Said he had to prove himself. Next morning, I found his bed empty. He was gone, headed to the one place that was sure to get him killed. I put the saddle on my mule, and rode him near to death tryin’ to catch up to the boy. After a day’s worth of riding, I found him. There he was, at the entrance. Frankly speakin’, it was a miracle he even got there in one piece. Everyone who’s got an ounce a’ sense in their heads knows that no one who enters Grimskull’s Crypt leaves alive. I told him this. I shouted at him, begged him, pleaded with him, told him that this wasn’t what his mother would’ve wanted. He turned around at the door, nothin’ but the rags on his back and a pitchfork that he was usin’ like a polearm. He was scared. He started to walk back towards me, started to call out to me. And that’s when the door opened. That’s when the laughter began. It came outta the darkness and took my boy. I went in after it for hours, days maybe, but I couldn’t find my son, or the strange beast that stole him away. We were all silent when the man finished. There was nothing but the sound of the fire, and even that seemed like a hollow, insufficient thing. A little bit of life seemed to be taken out of Deidrick. Deidrick shook his head, slowly. The man walked away from us, and I alone watched him go. There are still nights when I wish that I had just stared into the fire like my companions. He turned back to look at me, and the firelight showed me his face underneath his hood. It was drawn over his bones as though it was removed, dried, and put back on again. As he turned more towards the light, I could see that he had just one eye. There was only a concave, fleshy area where the other one should’ve been. I could see maggots writhing in the empty socket, tunneling deeper into his flesh to escape the light of the hearth. He smiled at me with rotted teeth, and I looked away in horror. The man’s story was racing through my mind. Everyone who’s got an ounce a’ sense in their heads knows that no one who enters Grimskull’s Crypt leaves alive. It’s Tuesday! You and 30,000 of our closest friends know what that means: time for another Featured Artist Showcase Shop! Every Tuesday, your favorite online adventure game features a certain artist as they showcase their personal stash of items, unleashing their unique flair for the (AQ)world to enjoy! As the timer ticks down on Aegis’ shop, everyone is anxiously awaiting Tyronius’ Blood Lord and Abyssal Darkness-themed armor sets! Tyronius is the one and only true ShadowFire God. A thousand years ago, Tyronius fell to an ancient hero, losing all his power, his realm, and everything else. With the help of his time-traveling brother Cronix, Tyronius was brought back to life… kind of. By using the Blood Lords as puppet minions, Tyronius collects the released power from Chaos Lords, Dage, and Nulgath, slowly regaining his strength. 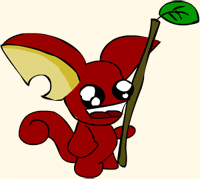 In the real world, Tyronius hails from Poland and is a volunteer artist, just like his twin brother, Cronix. Their father drew a lot and the boys always wanted to make an impression on him—and what an impression they have made! Tyronius first discovered Artix Entertainment when he was 12 years, but AQW ruled his heart. 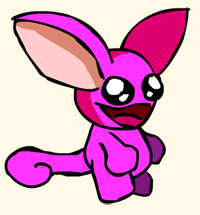 Here is the 1st thing Tyronius ever made in January 2009! Now it’s your turn to taste the sweetness of Tyronius’ triumphs. 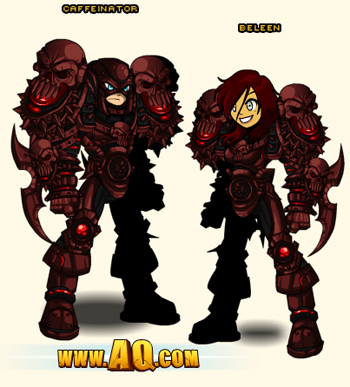 Get your Blood Lord Plate Armor Set and the Abyssal Darkness Armor Set later on this afternoon! Gold is good… but AdventureCoins are so much GOODER! If you wanna score the best items from Tyronius’ Shop and all throughout the game, you should really stock up on some ACs. Upgrade to a Member and get bonus ACs for free! 2 MILLION DAMAGE vs CHAOS!? Greetings all! As you know, we have a long history of listening to you and doing our very best to "do the right thing." 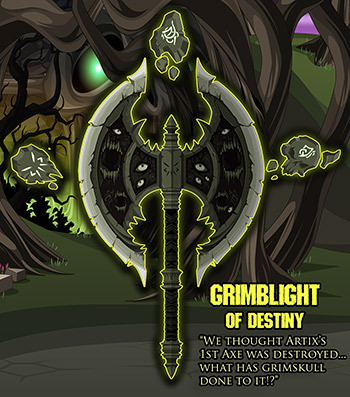 This weekend, we released a cursed battleaxe called the Grimblight of Destiny. It was supposed to do +5% damage against most monsters except undead... but due to a glitch it was doing 30x damage vs Chaos Monsters. Which was absolutely awesome for everyone farming Blade of Awe pieces from Chaos Lords. But, it is absolutely game breaking and as you surely understand, must be fixed. There was a great deal of misunderstanding about the hallucinagetic effects of the weapon, which includes AFK players appearing to die on your screen, and forcing all players into an idle position (which is great for lag). Despite this incredible weapon being unlike anything in the game -- the 30x damage bug and confusion have caused dissapointment and even a petition on twitter. Committed to doing "the right thing," there is only one solution... WEAPON RECALL! We are going remove and refund every Grimblight weapon in the game (at full AdventureCoins Value). Even if you had a Grimblight and sold it, you will get the full, correct adjusted amount returned to you. This is a very fair solution to a complex problem that should leave everyone feeling good. Then we are going to fix the damage bug. 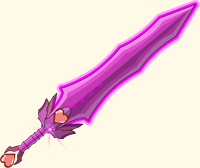 Everyone who wants this horrifying and amazing weapon, will be able to get the corrected version from Mort's shop. If you already sold your Grimblight, you will be given AdventureCoins to make the total amount you sold it for worth 2,000 AC. The Grimblight of Destiny will be put back in Mort's shop for 2,000AC so you can rebuy it. Mort will return each time Grimskull's dungeon updates to sell the GrimBlight of Destiny. 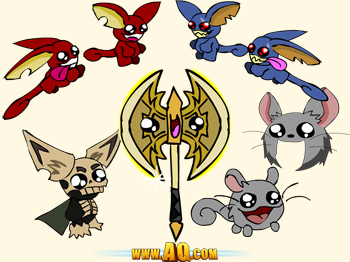 The axe will ONLY be available when Mort is in Battleon! This is Madness… this is MONDAY! Daddies make the best heroes ever! Show your dad how much he’s taught you by celebrating Father’s Day with Seasonal Rare items, arriving later today. Every father will enjoy the bounty of BBQ grill gear, the up-to-par Golf Suit set, a Gravity Defying Coffee Mug, the paper-cut-inducing Newsparchement, and the good Ol Fishin’ Armor Set. For the past 2 months, every Tuesday has been dedicated to one of our awesome AQW Artists. And they get to showcase their personal stash of never-before-seen (unless-spoiled-on-the-Design-Notes) items in Battleon’s the Featured Artist Showcase Shop. And tomorrow is Tyronius’ turn! Tyronius has been responsible for absolutely AMAZING armor sets since October of last year, and tomorrow is his chance at infinite stardom! Visit the Design Notes tomorrow and get the full scoop on Tyronius. Look! Up in the sky! It’s a bird… it’s a plane… it’s the Hero of Steal Armor Set! To celebrate the blockbuster movie release of the most super man the world has ever known, AQWorlds is releasing our own version of the “Hero of Steal.” These super items are some that Clark kent pass up! Hero of Steal item set is flying on in this Friday! No one can really predict the future (…and if you CAN, please come work with the AQW team!). But just because our magical crystal ball is broken doesn’t mean we can’t set future goals! 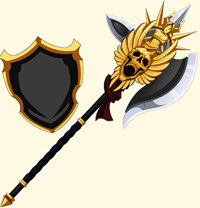 We thought Artix's 1st axe was destroyed... but oh no. It fell into wicked hands that reforged something horrifying: The Grimsblight of Destiny! 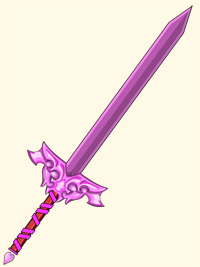 The weapon does bonus damage against dragons and... well, pretty much everything EXCEPT undead. When you click the center of it, it unleashes a laugh and three rune covered stones appear. Each stone activates a different feature. The first attempts to kill AFK players in the room. It is rumored the axe plays with the mind of it's master and has a slightly hallucinogenic effect. The second casts a wave of confusion which causes all players in the room to return to their idle stance -- Handy for decreasing lag for those "ahhhh... stop dancing.. TOO MUCH LAG" moments. The third rune has a special ability which will be revealed next week when the "VAULT OF ENDLESS DOOM" opens. 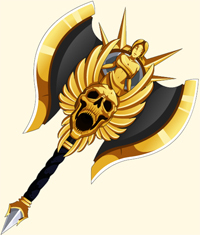 Grimskull's assistant, Mort, will be in the town of BattleOn selling this axe for an insane amount of AdventureCoins to raise funds to complete the dungeon. 2,000 AC. The Blinding Light of Destiny (which is a non-Member item) is also getting improvements tonight. It will do something special when you click on it. Great for photo ops! Reading has never been so dangerous! Maya is a Loremaster. She is training assistants... want in? First, you will have to learn EVERYTHING about Lore. (The hard way) The first step is learning all about monsters. You will find and battle specific monsters from all over the world. Talk to Maya in the Library. Members get first crack at facing the hardest battle in the entire game. We are only calling it hard because... no one has actually defeated Binky yet. If you do, you will get his Uni-horn. It is a 100% drop relic that has the power to "break apart the most powerful weapon in the world." 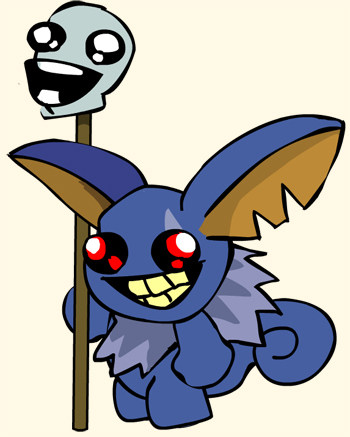 Developer's Note: Binky was originally a surprise monster from Grimskull's "The Endless Pit of Doom." We will be balancing Binky based on your experience with him.... making him harder or easier so that it takes a skilled team of 6 high level players. This fight will be available for ALL PLAYERS next week inside the new dungeon. NEXT WEEK: The Vault of Endless Doom! Grimskull is eager for you to enter his first dungeon. It will open next Friday. At the request of many players, this new dungeon is available for ALL players, and focused on gameplay and... sneaky death traps. The dungeon is secretly in two parts. The first part is a compelte adventure and designed for players level 20+. However, if you are clever, you will discover there is a second, level 40+ area which is far more deadly. Terrible "Trap Construction Accident." Evil Unicorn reported on Lose. Grimskull's 1st dungeon, The Endless Pit of Doom, is being pushed back one week due to the unsightly massacre of the entire dungeon creation crew this morning. Eye witness reports confirm that traps were triggered in room #5, affectionately known as "The evilist room ever" resulting in the activation of the spiked ceiling, razor saws, lemon flavored acid juice and a giant pit trap. The worker minions who survived were hunted down by Binky the Magical Man Eating Unicorn who is now reported to be on the loose. 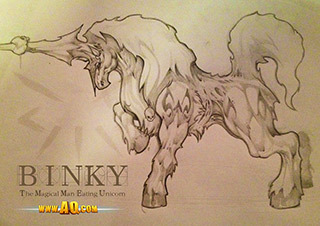 Coming THIS FRIDAY: Binky the Magical Man Eating Unicorn! The full dungeon will be released NEXT Friday... so this week, a band of overly agressive heroes intend to battle one of the dungeon's escaped surprise monsters, Binky the Magical Man Eating Unicorn. He is a level 50 challenge fight requiring a skilled and coordinated group to defeat. Rumor has it Binky aborbs magic from the air allowing him to emulate the skill of ANY BOSS MONSTER in the world. Yes... you heard me right. Binky can potentially do the special moves of any boss monster (past or future) in the game. Original intended by Grimskull to be a surprise, Members will get first crack at this magical beast. The lucky few who can defeat him will obtain his Unihorn -- an indestructable object that possesses the power to break apart the worlds most powerful weapon. Also... new Quests in town! Loremaster Maya, who is located in the town of Battleon's library will have new quests for you. 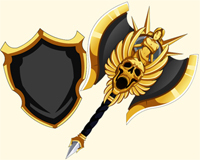 Artix's battleaxe is known as the Blinding Light of Destiny. 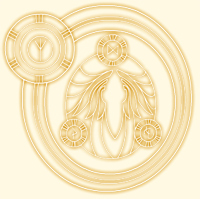 It is a powerful force of good, powered by millions of spirit orbs, it is the ultimate weapon against the undead. Not long ago, the Blinding Light of Destiny was shattered and destroyed in the epic battle against Vordred, the Paladinslayer. 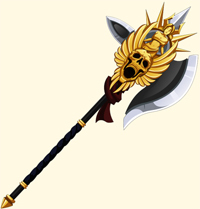 Thought to be lost forever, Artix and the heroes ventured to forge a new Battleaxe. However, what remained of the previous Battleaxe had been reconstructed by wicked hands. Those who have set eyes upon it call it the "Grimblight of Destiny". It is an evil weapon that does 5% BONUS DAMAGE against pretty much every type of creature EXCEPT undead, and grants the user a rep bonus. If you click on it, it unleashes an evil laugh... and may try to kill other AFK players in the room. Grimskull's assistant, Mort, is reported to be selling it in town this Friday for an unspeakably high number of ACs in order to raise funds to hire new (and less clumsy) dungeon workers. Summer is here! YAAY! The sun is out, school is out, and everyone is flocking to their favorite vacation destinations. If you’re nowhere near a beach—fear not! 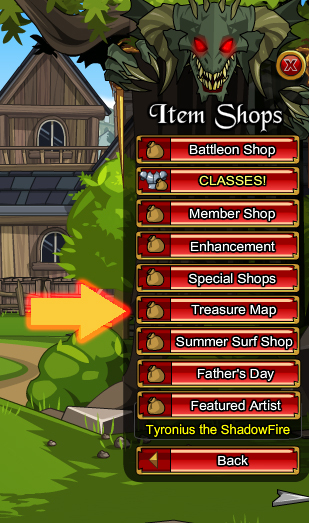 The Summer Shop in Battleon is open for business, and you can get all kinds of summer Seasonal Rares! 5 new RARE Surfboards have been added to the shop… and also the highly-anticipated color-custom Victory Swimwear! Okay. Srsly. 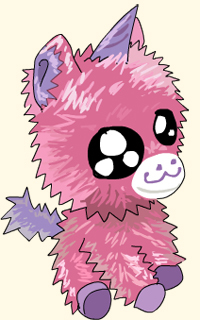 How could I NOT have a plushie pony weapon in AQWorlds? Problem solved! Since my Featured Artist Showcase Shop is like 2 weeks away, I’ll put that pinkie pony in my special shop (along with a whole bunch of other random items that make me giggle!) for everyone to enjoy! Thanks again, DarkAxe15! 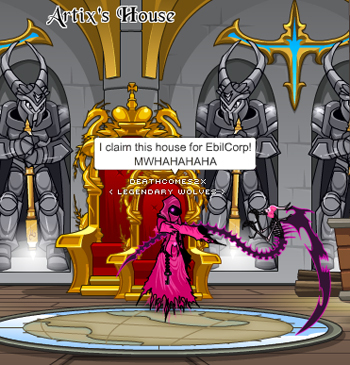 When best friends DeathComes2x and TheSaucyKnave came around, DeathComes2x showed me his hilarious-to-me-but-not-so-funny-for-Artix screenshot of his EbilCorp trickeries. Well done, DeathComes2x! 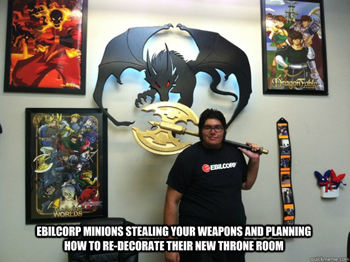 Furthermore, DeathComes2x posed for an EbilCorp photo and Chairman Platinum posted this picture on QuickMeme.com. You can even vote on how meme-worthy it is by clicking on the pic! 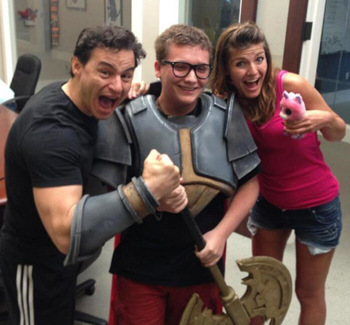 The entire Artix Entertainment staff loves meeting our fellow heroes in person! It’s so awesome playing with you guys and gals in game… but even awesome-er when we get to meet you in real life! Wanna visit the Secret Underground Lab? Well first… you gatta find our undisclosed address. And then you gatta find the person in charge of scheduling tours. And then you gatta make it to the lab using no other means of transportation besides a dragon. Featured Artist Showcase Shop Showcased! I love words. I also love pictures. And if a picture is worth a thousand words… then this Design Notes post is OVER 9,000*! All these items are now available in Battleon’s Featured Artist Shop. Bring the light to the fight! *Is the “over 9,000” meme still used? Is it still funny? Do memes ever really die? Let me hear your thoughts on my Twitter! "A dungeon everyone is DYING to get to the end of..."
Grimskull's 1st Dungeon "The Endless Pit of Doom" is unlike anything that has appeared in game thus far. It is full of traps and puzzles. The dungeon secretly has two parts. The first part is lower level (but just as deadly) designed to mercilessly kill players of all levels and skill. We hope you have a sense of humor.... in previous dungeons cutscenes are all about you doing heroic and awesome stuff. In Grimskull's dungeons, cutscenes are all about you going *SPLAT*. The second, hidden, part of the dungeon may never even be found by casual players (You would actually have to read to figure out how to access it... "OMG!") and contains high level monsters and excrutiatingly painful versions of the traps. The reward, will be well worth it. However, be warned-- part 2 will probably not be available this week... because the first half of the dungeon is 42 rooms long, each one requiring custom code by the programmers. The most complicated dungeon ever programmed in the history of the game. This is... a new "1st!" Due to the connectivity issues that we have been having today, stopping a lot of people for playing for hours at a time, we decided to keep Dage's shop in for an additional day to make sure that everyone has a chance to pick up the items that will be going rare tomorrow. Aegis's shop will appear today on schedule and this will not impact his timer. We just took the timer off of Dage's shop. Later Today: Enter the Age of Aegis! Tuesday is here! 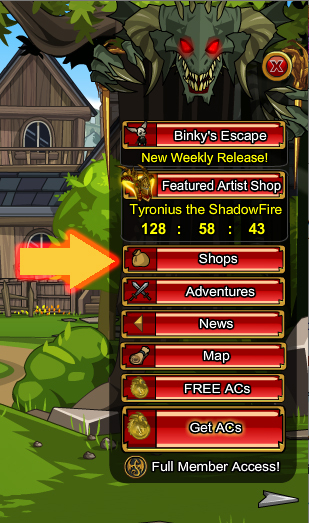 And everyone knows what that means: a brand-new Featured Artist Showcase Shop is coming to Battleon this afternoon! Every Tuesday, one of the wonderful AQWorlds artists showcases their unique flair and style with a shop full of items that inspire them! 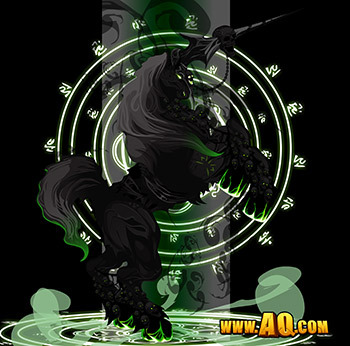 We have seen amazing item sets from Vokun, Memet, Hizu, Mido, Nulgath, Jemini, and Dage the Evil. This week, we are showcasing never-before-seen items from our volunteer artist, Aegis! Get your Golden On as you become a Gilded Champion! Officially joining the team in 2011, Aegis is technically a volunteer artist, but wants to become a bigger part of the AE family. And with all the AMAZING art Aegis pumps out every week, who could blame him? Aegis exhibits an over-fascination of shiny things...and explosions!! 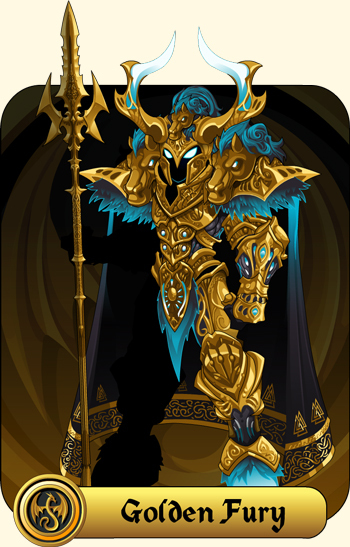 Head to Battleon now and stock up on Dage the Evil’s OathKeeper Armor Set before Ageis brings gilded glory to the world! 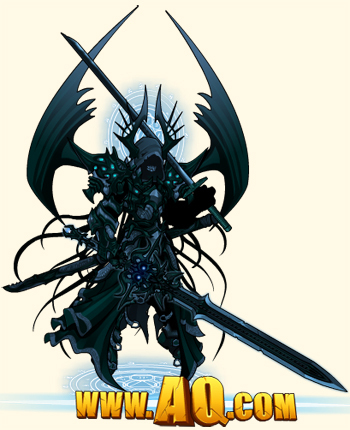 Last Tuesday, Dage the Evil unleashed his infamous OathKeeper Armor Set in Battleon’s Featured Artist Showcase Shop. With SOOO many Rare items to choose from, you’re bound to become Epic in 1 way, or, more accurately, in 22 ways! 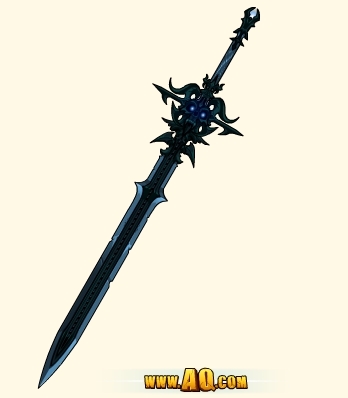 Here is your LAST CHANCE at owning Dage’s OathKeeper Set before it leaves FOREVER tomorrow afternoon, Tuesday June 11. And here is the breakdown of all of Dage’s items so you know which ones you just HAVE to get! As you can see, a bunch of these items are Member Only, or sell for AdventureCoins. And because summer is here, now is the PERFECT time to Upgrade your Membership and score a bunch of ACs! AND saving the MOST money! Dude. I spend MORE than that on my Frappichinos. Everyday. Why can’t Starbucks offer a sweet membership deal like AQWorlds? I’d totally buy it! This is FUN! Wanna break that apart even more… by day!? OKAY! Obtaining your 12 Month Membership is by far the best deal in the whole world—and the whole world wide web! Looking for epic summer adventures without breaking the bank? Want to flaunt your coolness during the scorching summer heat? Wanna become epic, get epic items, score epic bragging rights, and obtain the most epic deal? Upgrade your AQWorlds Account now! Ganna get down in Battleon! Happy Friday! Today is very exciting for me; not only will we get to travel to the mysterious Isle of Fotia tonight, I also got to spend the day with the SUATMR contest winner, Spongebuddy! 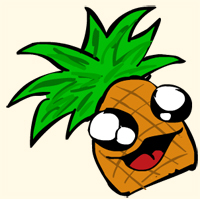 Spongebuddy is my biggest fan! 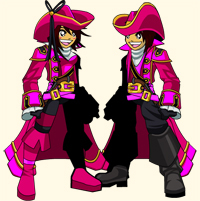 Spongie has like ZOMG every pink item ever made in AQW, and I got to spend the day with Spongebuddy in glorious PINK attire! Me and Sponebuddy got to hang out in his house (along with a lot of his friends) and then traveled to a bunch of different locations to answer all kinds of questions Spongebuddy had. Spongebuddy now knows ALL my Real Life Secrets! =D Including my shoe size, bwahaha! And Spongebuddy also picked the Spartan Warrior Armor as his in-game SUATMR contest award! Looks great on yah! And omgomgOMG it’s also Release Day! There’s so much coming tonight I’ve got to get back to work! More Design Notes coming soon! Stay tuned my loves! Get Your Gear While It's Still Here! 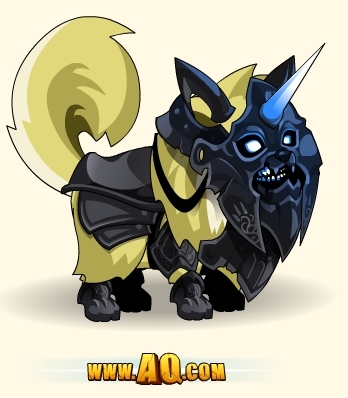 Daimyo's Birthday Shop Leaves Tomorrow! Pie-Rate Armor Leaves on Monday! 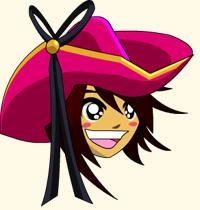 Captain Rhubarb's 10th Anniversary shop will remain in-game permanently, but not all of the gear will! 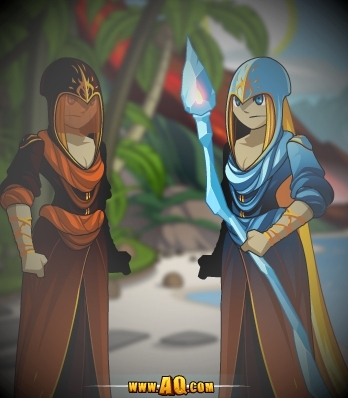 On Monday, Captain Rhubarb's AC gear will go rare, but the Member and Non-Member gold items will stay forever! If you want to revisit Captain Rhubard, just /join pirates and wander around the docks a bit. 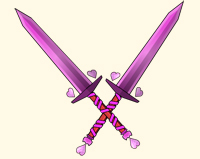 The members of the Femme Fatalities Cult have stockpiled a number of weapons, armors, and other gear in case of attack... or in case men trespass on their island (pay attention, Dage fans). When you /join pirates and take the ship to Fotia tomorrow, you'll be MUCH closer to getting your hands on this hot (and cold) gear! You'll be on fire when you battle as a Magma Protector! Dage's Artist Showcase Shop Update! MORE gear from your favorite Evil artist! Find his current shop (and the count-down telling you how much time you've got left) in your game menu! 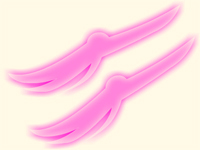 Dage's Scorn Saga 1: The Femme Fatalities! All right, all right, settle down now and take a knee. Grandad’s gonna tell you young’uns a story, so sit down and shut up. Especially you, Alfred. I’ve got my eye on you. Now this story isn’t gonna be like the other ones that I tell. That’s ‘cause this one is true. Or as close to truth as you can get from rumors and hearsay and what not. You might not think it to look at me now, but I used to be young too. I grew up in Lolosia. My father was a sailor, as was his father, and his father’s father. Sailin’ is in your blood. Anyhow, living in a port town, you hear plenty of rumors and other bric-a-brac from all around Lore. We got all sorts of tales. Sea creatures from the black depths of the oceans, big as islands, or lands across the sea with grown men and women no taller than your pinkie finger. These stories are told with loud, boisterous voices in the seaside taverns and inns. These stories are told when a man, or woman for that matter, wants to bring up the mood in the inn. That’s how you know that they’re lies. The true tales are told when the wind is high, and the thunderstorms roll into the coast. On those black nights, when sailors huddle together with their shipmates around the inn’s fireplace, they speak in hushed tones of the dangers and mysteries at sea. They speak of the Isle of Fotia. No, Albert, you can’t ask questions, Grandad’s talkin’. Now, where was I? Ah yes. Fotia. Not a lot of people talk about Fotia. There’s a good reason for that. No one who has sailed close to the Island has ever returned. The Isle is populated only by women, to hear the sailors tell it. Unlike island-sized sea monsters or pygmies, no one could deny the many disappearances of ships around that area for no apparent reason. Alfred, so help me... if you interrupt me one more time... No! No! I don’t care if you have to go to the bathroom, I’m telling a story. You know what? Fine. You’re adopted. There, bet that makes goin’ to the bathroom a whole lot less important, huh? Ahem. As I was saying before I was cut off, I actually have a little somethin’ that isn’t rumor. One morning, my father didn’t return from his usual merchant run. My mom and I waited for days, but there was no word of him, until, six days later, my father’s ship drifted onto the shore. It was a miracle the thing was still floating. The hull was riddled with holes. The sails were torn to shreds. It looked like it was attacked by a dragon. No one was on board except my father’s first mate, who we found hiding in the cargo hold, gibbering like a lunatic. His responses to our questions were more or less unintelligible gobbledy-gook, until we asked who had done this. It was his only lucid answer. He whispered it at first, his voice rising with each repetition of the name until he was screaming it without pause or restraint. Femme Fatalities. Femme Fatalities. Femme Fatalities. Alright, that’s Grandpa’s story. You kids should go toddle off to bed now. And would someone get Alfred to stop crying? He’s givin’ me a headache. Hi! I'm Notsgnal, AQWorlds' newest writing intern and freelance henchman. I'll be helping out this Summer, and there's a good chance you'll see more story Design Notes from me! We're on track for release tomorrow... unless the tornado blows the Lab off-course! But if it doesn't, you'll get the first release in the four-part Dage Scorned Saga! Reward previews and more news (like the gear for Dage's Artist Showcase shop) are coming in tomorrows Design Notes from Beleen! Abandon all hope ye who /joins Grimskull! 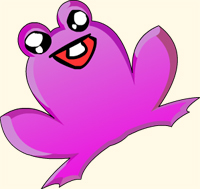 As you probably already know, I love delivering happiness, smiles, hugs, pink cute thingies, and warm fuzzies in-game and in real life =D I always have a positive upbeat attitude and loveloveLOVE all my wonderful Heroes who play my favorite online fantasy game with me! But YIKES! There is something—or um, someone?—who is going to sap that joy right out of me AND you, too. He goes by the name of Grimskull, and he’s the EXACT opposite of yours truly! So you know how we fight tooth and nail to defeat all the monsters in Lore? 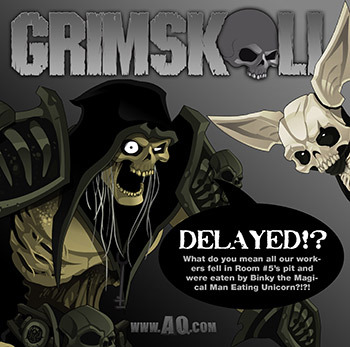 Well Grimskull wants to defeat all the players in the whole AQWorlds! 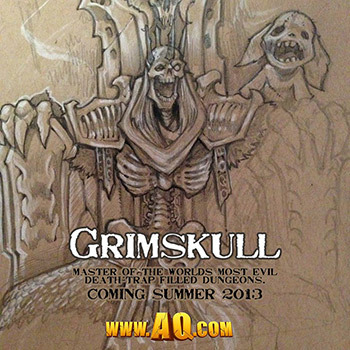 Grimskull has made a career creating the world's most evil, vile, death trap filled dungeons. And next weekend, Grimskull is getting a promotion: opening his dungeon doors to players like you! Legend states that the world's most powerful weapon lies at the end of Grimskull’s dungeon. A weapon so powerful that it makes the Blade of Awe, DoomBlade, and the Blinding Light of Destiny look like squeaky balloon swords. Even if you are the ultra-mega insanely-crazy Hero who storms headstrong into any battle… who is foolish enough to enter Grimkull’s dungeons?